Ernie Ball has to be one of the biggest guitar and bass string manufacturers in the world (and they still make their strings in California), but despite their hefty market share they do not rest on their laurels. They keep coming out with new products, and I am a big fan of their Cobalt and coated strings, as well as their adoption of sealed string packaging to keep them as fresh as possible. When the company introduced their new M-Steel guitar strings earlier this year, It seemed to me that all of the huge leaps in string technology have already been done, so what different could this new construction make? But, as I looked into them a bit more and actually tried out a few sets I must say that I came away impressed. The big difference in this set is that the wound strings are based on a hex core that is made from Maraging steel, an alloy that is used in high-stress aerospace and military applications. The plain wire strings are made from tempered steel for additional resistance to fatigue. This means that these strings are supposed to last longer and be more resistant to breakage. Most recently I tied out the M-Steel Regular Slinky set, which consists of 0.010, 0.013, 0.017, 0.026, 0.036, and 0.046 gauge strings. I installed them on my ’62-reissue Fender Stratocaster and cranked it up through my Fender Twin Reverb. I was able to A/B them with a new set of regular Slinkies on a similar Strat, so I could get a better idea of what they are really doing. And I did not really need the comparison guitar, as right away it was obvious that the M-Steel strings were much louder and brighter (even for new strings), and they had a bit more sustain. More impressively, they were also able to produce more bass and low-mids. This performance kept up for the two weeks I tried them , with very little degradation in tone and volume, despite pretty heavy usage. By the time I would ordinarily be installing a new set of strings these things still sounded very good. This is a good thing, because they do cost a bit more than regular Slinkies, with a list price of $21.50 and a street price that is right around 12 bucks. 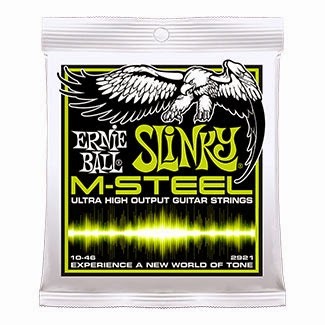 From this experience, I would recommend giving a set of the Ernie Ball M-Steel strings a try, as they will last a bit longer than their normal line of strings, and they certainly do sound good!